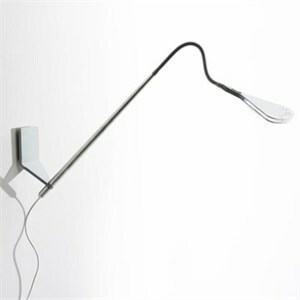 A sophisticated reading lamp with a lightweight frame that uses the new LED Chip on Board terchnology. A series of multicolor diodes produce an intense, warm and pleasing light with very low energy consumption (only 5W) and an average duration of some 50,000 hours. One colored filter in the head allows for the regulation of the color temperature. When it is switched off, its profile is illuminated with a blue light so that the lamp can be found even in the dark. Flexible aluminum stem. Anodized aluminum and injection-molded methacrylate head. Bent and enameled sheet metal wall support. Finish: Aluminum stem, white or aluminum support. Fixture is equipped with cord and plug.